Nancy Pfister's Facebook photograph shows her enjoying the outdoors. The Colorado Bureau of Investigation and the Pitkin County Sheriff’s Office are investigating the possible homicide of a woman who lived in the West Buttermilk Road area. 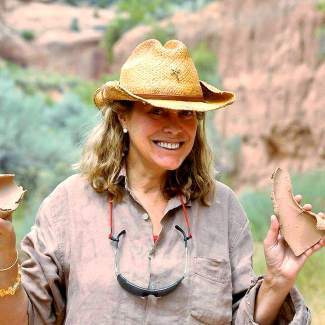 The Sheriff’s Office released a short statement saying the woman is “believed to be” Nancy Pfister, 57, an Aspen native. The Sheriff’s Office was tight-lipped most of Thursday with regard to releasing any details about her death — which authorities became aware of Wednesday evening — or the investigation itself. A bureau truck equipped to deal with forensics evidence was seen entering the private driveway of Pfister’s residence at 1:15 p.m. Thursday. Yellow crime-scene tape surrounded her home, and a Sheriff’s Office deputy stood guard outside the front door. Also on Thursday, three Pitkin County patrol vehicles departed the Aspenalt Lodge in Basalt at about 7 a.m. Thursday. A few minutes later, a tow truck was called to the scene, and it hauled away a passenger car from the parking lot. Two people were taken into custody at the Aspenalt, according to a law enforcement official who was there. Additional deputies remained on the scene the entire day, standing in front of two hotel rooms. It was not immediately clear Thursday evening whether the investigations at the Basalt lodge and at Pfister’s residence were related. In addition to the deputies, a CBI agent was present at the lodge. If the investigation ends up resulting in a homicide charge, it will mark the first such case in Pitkin County since late October 2001. In that incident, Andrew Kachik was accused of first-degree murder following the shooting death of Thomasville resident Vincent Thomas, who had been dating Kachik’s ex-girlfriend. Pfister was well-known in the Aspen area. Though she was visiting Australia in early February, she posted several items on her Facebook page at the time, remarking how she missed family and friends. In a Feb. 6 posting, she wrote that she was planning a trip in the spring and sought help with renting her house and watching her dog until the end of May and June. Shortly before 12 a.m. Thursday, on the same social-media site, Anita Thompson, wife of the late journalist Hunter S. Thompson, posted a simple message. “We love you Nance,” Thompson said. Pfister’s Facebook page also states that she attended Aspen High School and was self-employed. A friend, Elsa Mitchell, emailed The Aspen Times late Thursday night from Mexico, saying she was in a state of disbelief and shock. “I always thought of Nancy as a flower child, a free soul full of kindness and happiness, and a Peter Pan who would never ‘grow up’ in the sense of the words as an adult is meant or destined to. She will be sorely missed,” Mitchell wrote. Nancy Pfister’s mother and father, Art and Betty Pfister, were prominent members of the community for many decades. Art and Betty met in the lift line at Aspen Mountain, and they married in 1954. Art died in 2007, and Betty died in 2011. Betty earned the Congressional Gold Medal in 2010 for her role in the Women Airforce Service Pilots, created in 1943. The WASPs were the first women to fly military aircraft for the United States. She also owned and flew a single-seat P-39 fighter plane after the war and was a Pan Am stewardess for a time. Betty learned to fly helicopters and was instrumental in developing a heliport at Aspen Valley Hospital. She also pushed the Federal Aviation Administration to provide a control tower at the Aspen airport. Art attended flight school after World War II began, was a flight instructor and flew C-46 planes from India to China, delivering gasoline. His postwar career included time on the Aspen Skiing Co. board of directors and helping to develop Buttermilk Mountain.